G/BA's work at a large commercial property in Des Moines, IA, has been honored with the ASHRAE Technology Award. The firm’s Assessment, Modeling, and Improvements project at 801 Grand, a 44-story downtown office building, received First Place in the Commercial Buildings – Existing Buildings Commissioning (EBCx) category. The project was previously awarded the 2017 Excellence in Engineering award by the ASHRAE Illinois Chapter, as well as the 2018 ASHRAE Region VI Technology Award. The Society-level Technology Award competition is an international program that recognizes ASHRAE members who design and/or conceive innovative technological concepts that are proven through actual operating data. Constructed in 1989, 801 Grand includes podium-level retail shops and restaurants, as well as a lobby and parking garage. It is an all-electric facility, other than natural gas for cooking and for podium-level retail tenants. The project was acknowledged for analysis and improvements that occurred between 2012 and 2016. Owner Principal Financial Group and management firm JLL hired G/BA to assist with an energy efficiency assessment with a related investigation to recommend solutions to a problem of high levels of wintertime outside air infiltration. These tasks would support JLL’s effort to certify the facility under LEED EB: O&M and to improve indoor environmental quality pertaining to air infiltration during cold weather. The scope included an ASHRAE Level 3 energy audit, incorporating a calibrated energy model. The client also sought to reduce infiltration of outside air to improve conditions in the lobby and skyway connections. CONTAM modeling indicated that physical barriers to air infiltration would be effective and reduce the need to rely on HVAC-based countermeasures. New doors were installed on the skyway linking 801 Grand to other buildings, and high-speed doors were added to the parking levels. The Level 3 audit, done collaboratively with JLL, resulted in recommendation of numerous energy conservation measures. Current-sensing data loggers were used; G/BA and JLL also did off-hours walk-throughs to help assess conditions when occupancy was low. Eleven low- or no-cost measures were implemented, totaling $244,515 in annual savings, with a payback of less than a year. 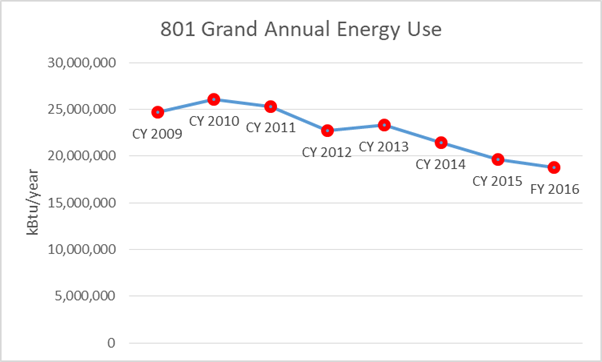 Significant items in this category included seasonal adjustments of the HVAC schedules; turning off bathroom exhaust during unoccupied periods; and changing lighting schedules. Less energy was used to heat and ventilate the facility due to the physical barriers to infiltration, and the HVAC system was allowed to remain off for extended hours even in colder weather. Lighting and controls retrofits on tenant floors also provided cost savings for the occupying firms. Capital improvement projects from the assessment remain to be implemented. Total bundled implementation costs were estimated at $3.05 million, with calculated annual savings of $424,157 and a combined simple payback of 7.2 years. The project was a group effort that involved not only the G/BA team and property manager JLL, but also significant input from the facilities staff and contractors. David DeBo and Joe Galambos from JLL managed the project for the client, with William Johnson as Principal’s leader for the work. G/BA staff John Tsingas (Vice President) and David Eldridge (Associate) led the assessments investigating energy efficiency and reduction of infiltration. CONTAM modeling was performed by Matt Clemen, G/BA Senior Project Engineer. Eldridge traveled to Atlanta to represent G/BA at the awards ceremony (above). A technical article with additional details about the project will appear later this year in ASHRAE Journal.